Pure Laundry Powder is our multi-award-winning best seller. Made with just 100% coconut oil soap, natural minerals and water softeners, it is tough on stains but very gentle on delicate skin. Our 100% natural formula is free from synthetic detergents, phosphates, optical brighteners, enzymes, fragrances and preservatives. It is the perfect alternative to biological and non-biological products that can irritate sensitive skin. Suitable for both machine and hand washing, Pure Laundry Powder is perfect for even the most delicate fabrics. It leaves everything clean and very soft without the need for fabric conditioner. If you’ve forgotten (or never known) the scent of clean fresh air on your laundry, you’re in for a treat. Use it to gently hand-wash wool, cashmere and silk. 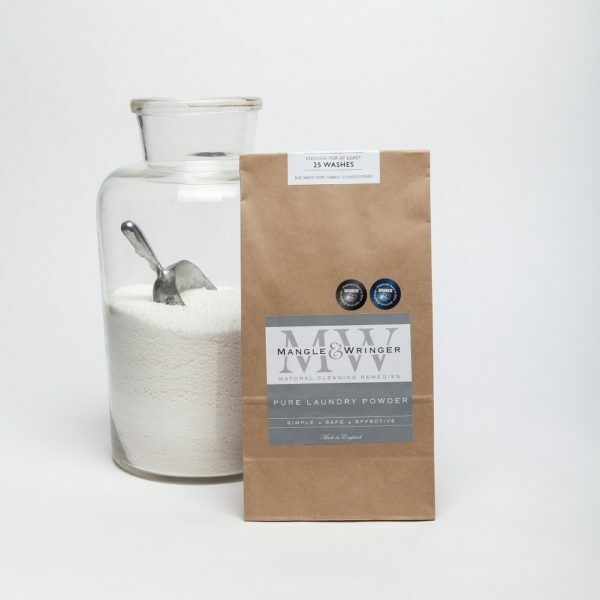 A safe and natural fragrance-free washing powder, made using pure coconut oil soap, natural minerals and water softeners, for a wash that’s tough on stains but gentle on delicate skin. Free from detergents, dyes, fillers, perfumes, phosphates, optical brighteners, enzymes and petroleum based ingredients. Safe for septic tanks. Use between one and two scoops depending on water hardness. For full instructions see our information sheet. 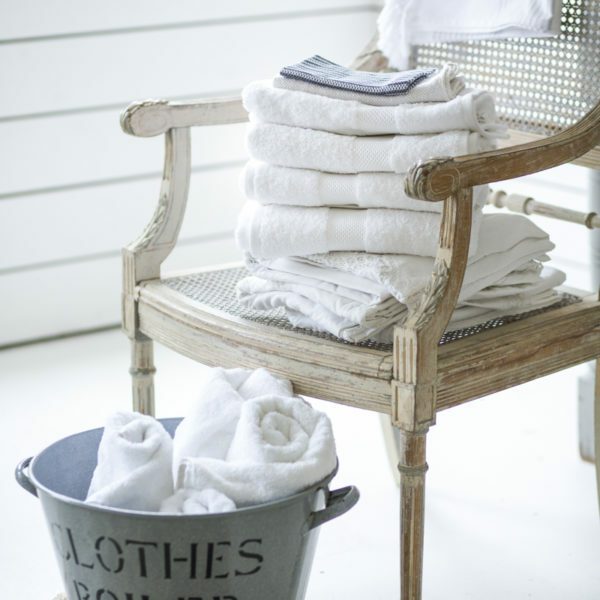 View and download our Stain Removal SOS guide for top laundry tips. Coconut Oil Soap, Sodium Carbonate, Sodium Sesquicarbonate, Sodium Percarbonate, Sodium Citrate, Citric Acid. Please select 'Yes' from the drop-down option above if you wish us to include a laundry powder scoop with your order. We are transitioning to card scoops but for the time being please note that they are plastic. At the heart of all our products is Bette’s original coconut or coconut and sunflower oil soap. Our coconut oil is fairtrade and supplied to us from a women’s co-operative in Ghana. Our organic sunflower oil is from Europe. None of our products contains palm oil or palm oil derivatives. They are non-toxic, biodegradable and free from all artificial preservatives, fragrances, SLS, SLES, phosphates or petroleum based ingredients. They have never been tested on animals and are safe for septic tanks. If you would like more information on any of our ingredients please email us at hello@mangleandwringer.co.uk. This powder is excellent. It cleans the laundry well and is also kind to the environment. It is not strong smelling like some laundry detergents. It is safe for my septic tank too. I use it to wash all types of fabric and everything comes out clean. I give it full marks. I’ve been using Mangle & Wringer products for 2-3 years and would never use anything else now. The laundry powder is brilliant and at the same time so gentle. I have really sensitive skin and it’s the first range of products that don’t cause me any skin irritations at all. Everything they make works exceptionally well and it’s great to know there are no nasty chemicals in any of the products. Just finishing my first order of the laundry powder and re-ordering. It cleans so well, great with delicates, wool and general laundry. Natural with no nasties to irritate the skin or pollute. This is a super washing powder. I was given it by a friend as I have extremely sensitive skin, and this is the only powder I’ve found that doesn’t cause any irritation whatever. I’m thrilled to have found it and will become a regular customer. Thank you. I have only just started using this product and it is seriously amazing.This laundry power cleans beautifully and contains no nasties ! Plus clothes so soft without any conditioner. 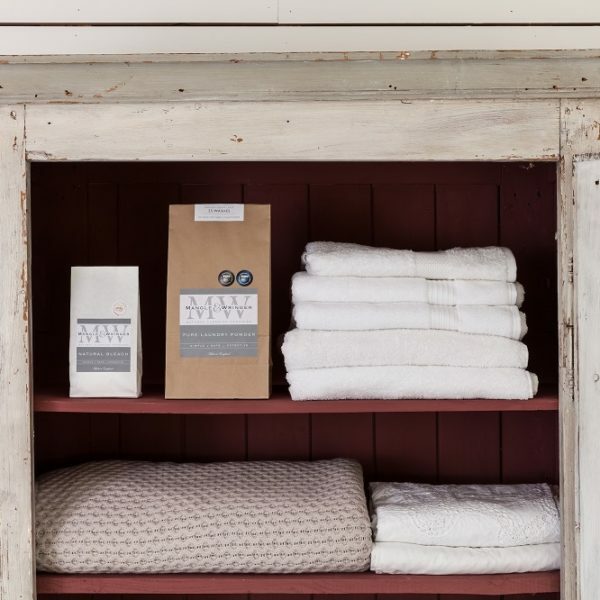 I was sceptical having tried other eco laundry products and been disappointed but living aboard a sailing boat I cannot buy a power that is harmful to the ocean so I gave this a go and WOW I’m so glad I did. It is absolutely fantastic. I am so pleased and very relieved to have finally found a product that does not harm the plant and actually works. I will be purchasing again. What can i say! The best find of my life! Finally a non scented washing powder that does a great job of removing every mark and stain on my families washing. Grass, mud food – you name it all gone. I love this washing powder and it’a another Mangle and Wringer product I’m totally addicted too. Fab- u-lous Not purchased softener since started using and leaves everything clean, soft and non-chemically.